The El Paso Regional Campus (EPRC) of the UT School of Public Health opened in 1992. With the US-Mexico border less than a mile from the campus, the curriculum, research and community practice focuses on the unique health problems facing border populations. The sister cities of El Paso and Ciudad Juarez lie at the midpoint of the US-Mexico border. These cities, with a combined population of over two million people, form the largest international metroplex in the world. 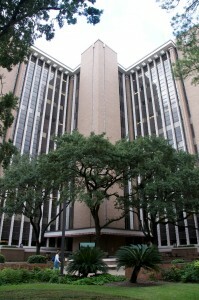 The UT School of Public Health EPRC offers certificate programs, a general Master of Public Health degree (Customized, Health Promotion/Behavioral Sciences, and Environmental Health), a Doctor of Philosophy degree in Environmental Health, and a Doctor of Public Health degree in Health Promotion/Behavioral Sciences. Faculty at the EPRC focus on health disparities in the border region and the results of those disparities are the primary focus of the ongoing research at the campus. Improving prevention techniques and promoting health services among the Mexican-American community are integral parts of the research efforts in El Paso. The UT School of Public Health El Paso Regional Campus offers all levels of graduate from certificate programs to master’s and doctoral degree programs. The Master of Public Health (MPH) degree is the basic graduate degree in the field of public health. The MPH degree offered at the UTSPH regional campuses covers all five core areas of public health: biostatistics; health promotion and behavioral sciences; epidemiology, environmental and occupational sciences; and management, policy and community health. The EPRC offers MPH degrees in Health Promotion & Behavioral Sciences, Environmental Health, and Customized. MPH classes are held at the El Paso campus and online. Classes are taught by El Paso-based faculty as well as faculty at all other UTPSH campuses via Interactive Television (ITV). Access to all UTSPH campuses via ITV gives students a broad perspective of the public health issues across Texas. Two doctoral programs are offered at the EPRC: a DrPH in Health Promotion and Behavioral Sciences and a PhD in Environmental Sciences. In the Health Promotion/Behavioral Sciences program, students complete a course of study focused on the social and behavioral aspects of public health and the development and evaluation of health promotion interventions, particularly among the Mexican-American Community. The PhD in Environmental Sciences offers in-depth didactic and research training for students who wish to focus their careers in academic, governmental or other research institutions, and/or in high-level policy/regulatory positions. State-of-the-art laboratories in El Paso provide cutting-edge research opportunities in the fields of environmental microbiology and infectious diseases. An MD/MPH dual degree program is available to students attending the Texas Tech Paul L. Foster School of Medicine is available to students. The program is integrated so that a number of courses and learning experiences in the medical school are counted toward the MPH degree program. The program prepares future health professionals to integrate medical and public health skills into practice, research and academia. Click below for information on the UTSPH Graduate Certificate Programs. Dr. Brown is currently leading three evaluations of community-based health promotion interventions. One project is Teens Against Tobacco Use (TATU), where youth serve as health educators and health policy advocates. A second program is Healthy Fit, where community health workers administer a health screening and then use motivational interviewing to help participants follow through on recommendations for cancer screenings, immunizations, physical activity, nutrition, and a weight loss support group. Finally, Red de Coaliciones Comunitarias is a network of over 20 youth substance use prevention coalitions across Mexico where he helps to enhance community coalition capacity and functioning. Dr. Mena’s research areas include water quality, food safety, and human health risk assessment. Her studies translate field data to public health impact using risk assessment approaches. Her work has ranged from predicting health outcomes among the flight crew at the International Space Station to estimating health consequences of Olympians who recently competed in the waters in Rio. She has also conducted risk assessments to evaluate the transmission of pathogens in the farm and hospital environments. Dr. Jones currently conducts three research projects on disaster impacts—including field work on the relationship between social networks and individual well-being like post-traumatic stress and depression after a day-care fire and a mine tailing pond spill in Sonora, Mexico, plus a project involving secondary coding and analysis of 100 past societies regarding how they have adapted to food-destroying disasters. He is also using social network analysis to support two projects on public understanding of science (including health and medicine)—one on rural science fairs in several communities in Arizona, and a second concerning middle school students’ online classroom conversations about science and technology. Dr. Brown works with several local partnerships in the El Paso region, including the El Paso Clean Air Coalition, the Paso del Norte Tobacco Control Network, and the Border Public Health Interest Group. He also works extensively with the City of El Paso Department of Public Health, the El Paso Independent School District, and the Alliance of Border Collaboratives. In 2013, Dr. Mena was appointed to the USEPA Chartered Science Advisory Board (SAB), as well as the USEPA Drinking Water Committee. She was recently re-appointed to fulfill a second, three-year term on the SAB. Locally, Dr. Mena is a member of the El Paso Public Service Board, the Scientific Advisory Committee for the Medical Center of the Americas Foundation, and the Borderplex Alliance. Locally, Dr. Jones is a member of the Paso del Norte Binational Health Council’s Environmental Health Committee, the Community and Academic Partnership for Health Sciences Research led by UT El Paso, is a volunteer at a local elementary school, and provides support to the Institute for Healthy Living’s work with the Paso del Norte Health Foundation’s Healthy Eating and Active Living initiative. Find out more about living in El Paso and life at the El Paso Campus. Take a look at our application deadlines for degree seeking and non-degree/certificate applicants.